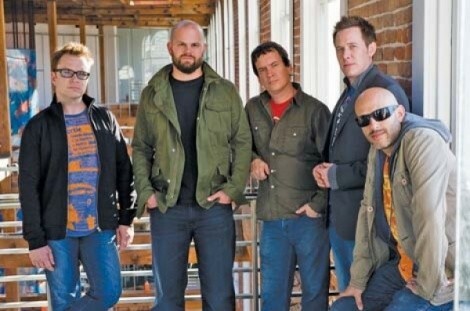 Melting Pot: New Orleans modern funk band Galactic simmers the Big Easy’s disparate sounds. It’s not a pre-flood New Orleans record, either, for that matter. These new-generation Big Easy funk pioneers have blended an album that shows off how alive and diverse the town’s music is—right now. After long-term frontman Theryl “The Houseman” DeClouet parted ways with Galactic in 2004, the five-piece band set out to make several concept albums with rotating frontmen, including 2007’s excellent hip-hop collaboration From the Corner to the Block. But this album is different. “It’s definitely a coming-home record. We wanted to work with [New Orleans] artists that we love and have admired over the years—both older, established artists and new, up-and-coming artists,” keyboardist Rich Vogel says. With classic brass bands and divas to hard-hittin’ funk players and drag queen rappers, it was no easy task congealing and packaging the disparate pieces. “We absolutely did not want it to sound like a hodgepodge or a variety pack or like we are jumping through the decades. This is all ‘of this decade,’ ” Vogel says. To do that, they did what they do best and—as Vogel puts it—“Galactic-ized” each track, putting the town’s finest musicians a little to the left or right of their comfort zone. And as tracks move along, each oozes with flavor, adding to the whole like a savory buffet of French-Creole fare. “We wanted to take [Allen] Toussaint and Irma [Thomas] outside of their element and bring them into our world and recontextualize that sound,” Vogel says. Toussaint’s track, “Bacchus,” is a smooth and soulful keys-driven groove, while the funky beats backing Thomas’ “Heart of Steel” show off Galactic-izing at its best. Rebirth Brass Band, Big Chief Bo Dollis, Trombone Shorty and Corey Henry are also featured on the album. Henry and Cyril Neville—members of one of New Orleans’ legendary musical families—will help pull it all off live during the western leg of the tour. It’s understood that no New Orleans genre is safe from getting cooked in the funksters’ unique slow cooker. Take bounce—a style categorized by the singular trigga-man beat, potty-mouth chants and call-outs and the drag queens who shout them—which is given more instrumentation and texture than normal. Featuring “sissy bounce” artists Katey Red and Sissy Nobby, Big Freedia and Cheeky Blakk, these tracks in particular give the album its hard edge and modern vibe. The members of Galactic first encountered bounce artists at little Crescent City neighborhood clubs several years ago. “It was a very underground and neighborhood-centered thing. It grew up organically from there, which is the story of all New Orleans music,” Vogel says. The artists featured on Ya-Ka-May, although divided by generations or musical styles, are essentially linked far more strongly than simply through Galactic’s funky take on their respective sounds. Sunday, March 20, 8 p.m.